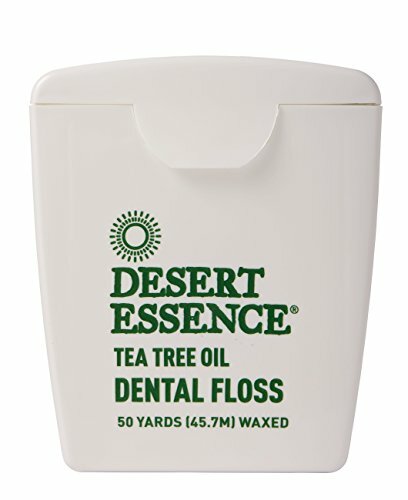 Desert Essence Tea Tree Oil Dental Floss cleans food debris off difficult-to-reach spaces between your teeth. It features tea tree oil, an active ingredient that possesses antiseptic properties so that your gums are not harmed while removing food particles. Desert Essence ensures that this product is not tested on animals and does not contain animal-derived ingredients. It is also devoid of synthetic perfumes. Other ingredients include propos, fennel extract, seaweed extract, and sea salt. With natural wax - this flossing tape is thicker than other flosses available in the market. It is coated with natural beeswax, which lets you use it at hard-to-reach spaces between your teeth. Unbreakable - this easy-to-use floss does not tear while using, which adds to ease of removing stubborn food particles between your teeth. Antiseptic action - this beeswax dental floss is infused with 100% pure australian tea tree oil that has antiseptic action on your gums. Convenience of use - cruelty-free floss by desert essence is available in on-the-go packs so that you can easily carry in while travelling. No harmful chemicals - desert essence assures you that this dental floss is not made from animal-derived ingredients, alcohol, artificial detergents, and synthetic colors. If you have any questions about this product by Desert Essence, contact us by completing and submitting the form below. If you are looking for a specif part number, please include it with your message.